PBL, Inquiry, and Research: What a way to begin 2019! When I did the “ant picnic” activity with my students in August of this past school year, I saw how citizen science can give students the opportunity to participate in authentic learning. I also saw how it helps scientists generate data that would normally take months or years to gather. I was so excited to find out that I was a recipient of a Citizen Science Conference Scholarship. As I wrote in my application, “I am excited about learning more about citizen science projects. These activities have increased the level of engagement of my students tremendously.” This is very true, as a teacher of English learners, I have seen how the citizen science activities that I have used in my classroom promote increased academic language use with my students. Now after attending the conference, not only am I even more interested in doing additional projects and activities, but I am interested in securing funding to develop a program/set of citizen science curriculum that will give my students more buy-in. I now envision citizen science projects that draw on students’ own funds of knowledge, and projects that have roots in the community: Projects that drawn on students’ own inquiries and lead to improving the community in which they live and are a part of. I want to give students a platform to solve the problems that they are passionate about and the workshops at the Citizen Science Conference have given me the tools to do this. Thanks to the CSA Conference, I am going from “Ant Picnic to a co-created, community-driven, empowering citizen-science based project. As I look back on the conference, I can categorize my experience into five major themes. I have listed each one below and I will provide my perspective on each one. I. Anyone can be a scientist! II. Science is all around us, we have get outside and experience it! III.Environmental justice is THE original citizen science! IV. Scientists need the community just as much as the community needs them! V. Partnerships and Collaboration make Citizen Science possible! This was a common, recurring theme that was present in just about every workshop that I attended. Everyone from the keynote speaker, Dr. Max Liboiron, to many of the participants I chatted with, said this. In fact, many in attendance did not have a science-background at all. When I first began to do some of the citizen science activities and projects, I felt as if I was occupying a space that I did not belong. I did not feel “worthy” of doing science. On the contrary, I discovered at this conference. Science is evolving and is striving to be more inclusive of others. Science needs more diverse viewpoints and is moving towards creating more equitable structures for gaining information. This movement toward diversity is powerful, as many previously underrepresented and marginalized communities will now be able to gather and contribute data about their concerns and use that data to advocate for change. II. Science is all around us, we just have to get outside and experience it! According to one of the workshop’s presenters, kids today can name more Pokemon! Characters than species of plants and animals. What does that say about our children today? Maybe, it’s that our children are not invested in nature anyone. With our society’s reliability and heavy emphasis on technology, our children have lost the wonder of going outside and connecting with nature as we once did. As a result, as species become endangered, future generations of children and young adults will not care because they won’t have the connections with them as we once did. 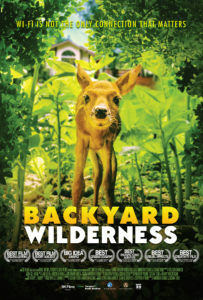 One of my favorite presentations at the Citizen Science Conference was the screening of the film, “Backyard Wilderness”. This is a brilliant film about the creatures and animals that inhabit our spaces shown from their point of view right in the backyard of a typical American home. This film looks at a girl doing a report about a salamander that goes about its life as she researches it on the internet and skypes with her friends about it online. All the while, the salamander’s ecosystem, habitat, and life is happening right outside of her window. It’s only at the end of the film, when she discovers the wonderful natural habitat and awesome creatures that exist right outside of her home and that she makes a connection with the animals and their habitat right in her own yard. After the film, there was a great discussion about how we as educators and parents can use technology such as the iNaturalist software, and Seek software to encourage our youth to explore the wilderness around us. There are existing initiatives such as “Bioblitzes”and Observations that encourage people to go out and explore. These apps use technology in a similar way that “Waze” and “Gas Buddy” use social media to provide a more interactive approach to exploring nature. This, not only encourages people to explore their own environment, but provides scientists with with a more precise idea of the number of taxa that exist in a habitat. One speaker defined environmental justice as making sure that vulnerable populations are being treated fairly when it comes to issues of water and air quality. 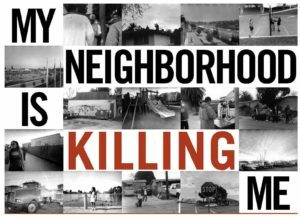 As a person of color, before going to this conference, I was very aware of issues of racial discrimination and prejudices in almost every area of society, but I never thought about inequities that exist in environmental practices. As Dr. Robert Bullard stated, “America is segregated and so is its pollution. Race and class still map closely with pollution, protection, and vulnerability.” After hearing more speakers and talking with several of the participants at this conference, I now understand these issues and I understand how data from citizen science can empower communities to have a more powerful voice with environmental practices. As one participant stated during a conversation, “Environmental justice is THE original citizen science.” He recalled how his community rallied together to get the playground mulch that was made from tires discarded. It was made of old tires which when decomposed produces a toxic and hideous-smelling substance. This condition of the playground went on for months, until the citizens began to do their own air quality tests and reported these results to the EPA. That’s when scientists discovered that the tires that were being used break down to produce a smelly, potentially hazardous by-product. Although, this had been tested in the labs previously, it wasn’t until this real-time, on-site data was collected in the community, did scientists realize that this was a problem in the community. This is the original citizen science. 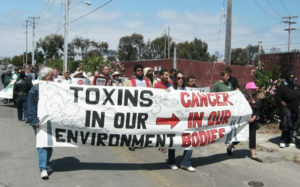 Today, this work continues and is possible largely because of citizen scientists in the communities being able to question and report their findings and own data to support what is unfair and unjust environmental practices against a particular community who before was marginalized because the inability to report data. IV. Scientists need the community just as much as the community needs them. When I came to this conference, I came hoping to gain more opportunities for my students and I to participate in citizen science activities and projects. I realized after doing “Ant Picnic” how participating in authentic science experiments can help improve my students’ engagement. 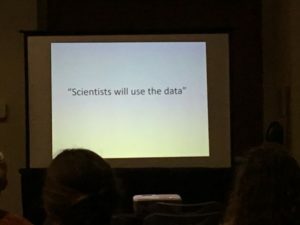 I saw how much more effective they communicated data, when they knew that their audience was a group of scientists. However, after attending the conference and talking with scientists, I realized that we, the participants of citizen science activities, who collect and interpret the data are really doing a major service for the science community. One scientist told me that without “citizen scientists” there is no way that she would be able to collect and interpret the data to explain and support the work that she does. Just then, I realized that scientists need us: the citizen scientists, just as much as we need them. It is truly a symbiotic relationship. Dr. Rob Dunn, of NC State University, credits much of his research to the number of citizen scientists who have helped him discover thousands of new species of microbes and insects that were not previously known about in North America. While, Dr. Libioron even insists on paying anyone who assists with her research. She says that citizen scientists are THAT important to her work. 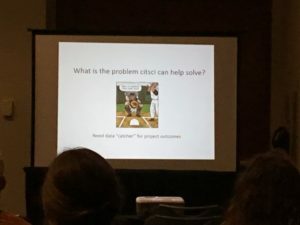 After leaving this conference, I realize how important the work we “cit-scientists” do for the scientists and I also recognize how doing authentic science increases engagement in students. In fact, I am leaving the conference with information about how this partnership between citizen scientists and researchers can lead to something really extraordinary. My students and I will be participating in the Eyes on ALZ project. While this will be very engaging and fun for my students, it will also be vital to providing data about how certain drugs respond to Alzheimer’s disease. This will be something that my students will be engaged in that will hopefully lead to a cure for a devastating disease. While I was at the Citizen’s Science Conference, I learned that Citizen science really is a win-win. It is one of the few things I know, where everyone involved benefits. I knew that citizen science is naturally a partnership between scientists and classrooms. However, I learned that the partnerships and collaborations can extend much deeper and further much richer results. There are a number of government and community-based organizations that partner to advance science. Each has its role. Whether it is a group funding the research, a group partnering with scientists to collect the data, or the scientists themselves analyzing and interpreting data, everyone has a mutual interest and investment in making citizen science possible. At the conference, I met several ICBOs (Independent Community Based Organizations) who want to partner equally with funders and university researchers to advance environmental justice causes. Similarily, there are university researchers, like Dr. Robb Dunn who are seeking classrooms and participants to help collect data about their investigations into research about topics dealing with The Ant Picnic Project, The Sourdough project, or The Great Pollinator Project. I discovered that there is a web of sorts whereby many are interdependent on one another to collaborate to make citizen science happen. Shortly after the students returned from the FAB LAB with planter kits in hand, I immediately began to think about a writing activity where the students could explain how to assemble their planters. After all, explaining a process is an important communication skill that English learners need to know. They need to be able to communicate to an audience in an organized manner using specific academic vocabulary words. The lesson was all set. I really had not thought about linking this activity to a career until a student asked, “How will we put this together, if we don’t have instructions?” So true, I thought. We needed instructions indeed. I asked the students if they knew where instructions came from. Many probably assumed that they just magically appeared or as another student pointed out: “We could just go to Youtube and watch how to assemble it.” It was at that moment that I realized that students could write/record the planter assembly explanation while simultaneously learning about a STEM career. Just then, I realized that this lesson about explaining a process could be turned into an opportunity to learn about and practice the skills of a very important STEM career: A technical writer. Technical writers, one of the highest paid STEM careers, are those who creatively write guides and how to instruction manuals. They take complex ideas and put them into a more understandable format. So, I posed the following scenario to my class: You are the technical writer tasked with creating an instruction manual or a youtube how-to video for a “planter kit” that a customer just purchased. Doing this added context to the lesson about explaining a process. One student even used this as his focusing question and hook for the audience. He went on to explain to his audience of customers how they would assemble the their planters. After the lesson and the submissions, I shared an authentic set of Ikea instructions and how this multi-billion-dollar company employs technical writers (many of whom are bilingual) to write instructions for their products. I think the students came away from this activity with good perspective about the importance of writing and also what career opportunities are available for writers. What a great week of instruction last week! For the first time this school year, I was able to focus on the design and planting portion of the “Tomatosphere” unit. 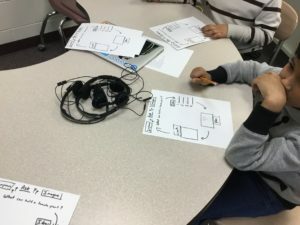 At last, students have sufficient background about data collection and communicating data and they have begun their research about plants, seeds, and tomatoes…so this week, they used the engineering design process to think about, plan, and create the planters that will house their tomato plants. To help with the creation/fabrication of the planters, students visited the MCAS FRC East Fab Lab and watched Mr. Lewis, the engineer in charge of the lab, create and talk about the creation portion of the engineering design process. I had asked students during the days leading up to the visit to think about things that could hold the seeds that we are going to plant. It was really fun to see and hear about all the interesting ideas that students came up with. There were students who suggested vases. Others who thought plastic bags worked best. Then, a few students even had the idea to house the seedlings in shoes. I explained to them that this is the imagine phase of the engineering design process. We discussed the ideas that they came up with and decided on one idea that they wanted to create. As I told them, engineers do the same thing as they are thinking about ways to solve problems. The next phase of the process is coming up with a plan for their idea. I informed the students that during this phase, engineers create what are called “blueprints”. I let the students know that blueprints are generated using computer programs and we even got to see the plans that the engineer and I designed to build the planters that we would see created. 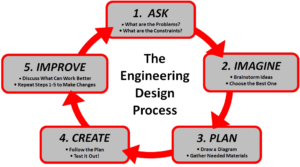 The next step in the engineering design process is the create phase. It’s here where make or fabricate the idea. I let the students know that we would see this part of the engineering design process in the “Fab Lab”. We would see the idea and plan that I came up with for housing the tomato plants being created today. 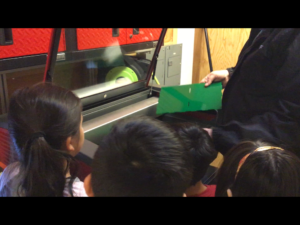 I let them know that they would be seeing machines called CNC machines and 3D printers. These machines use the designs uploaded from design software (called Computer Aided Design or CAD) to make whatever engineers have imagined. I explained to the students that this process is continuous because after something is created it can be improved by asking again what ideas do I have to make it better, then designing it or creating a plan, and creating the product that you’ve designed. I wanted to introduce the engineering design process to the students in a scaffolded way. There just wasn’t enough time to go through the entire process with them, so I explained it to them and let them know that they would be seeing only the “fabrication or making” part of it. I felt that the students had a good understanding of the engineering design process and one day would be able to take something from idea to product using the engineering design process. Then, a few days after students went to the Fab Lab and saw how a plan or design was created, one of my schools was visited by the Innovation lab from the NC A&T School of Engineering. This lab is a model design studio. 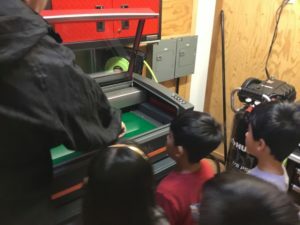 Students come up with an idea for something that they want to create (as many students recognized as the ask and idea phase of the engineering design process) and design it on their TinkerCAD software. . I could not believe that this was happening during the same week that I had planned a visit from the FAB LAB. Coincidence or cooperation? Through collaboration with the MCAS FRC East FAB LAB and the NC A&T Engineering Department, students got a chance to see almost the entire engineering design process in action. They saw how you can ask a question about how to solve a problem, then think about ideas to solve it, later design that idea, and finally create it. Is the tomato a fruit or a vegetable? This is an age old question. It ranks right there with the best of them: If a tree falls in the forest and no one is around to hear it, does it make a sound? Which came first, the chicken or the egg? And now…Is a tomato a fruit or a vegetable? So, when the question was posed, Ms. Swift chuckled a bit and gave one of the best answers that I have ever heard. “A tomato is technically a fruit,” she said. “It has seeds. Any plant that reproduces using seeds is a fruit. So in the science world, we call it a fruit,” she explained. “However, culturally it is considered a vegetable.” Then I heard a student whisper, “It’s both.” Then he did an “air fist clutch”. Later, after the presentation had ended, I thought about how crucial language is. It’s just not right to include tomatoes in the “fruit” category. After all, apples, oranges, pineapples, and bananas occupy that space, right? Further, the language mavens have neatly grouped potatoes, cucumbers, pumpkins, and tomatoes into the vegetable category. We have always referred to tomatoes as vegetables and that is that. I sort of chuckled and thought that maybe this could be the source of a great etymology lesson. After all, it is not very often that I get opportunities to teach linguistics and the sort. I quickly said, “Class, are butterflies flies?” “Do they have anything to do with butter?” A couple of students looked puzzled, then responded hesitantly, “No.” “What about pineapples?” I continued. “Are they apples?” “Of course not, but we call them such because that is the name we associate with them.” “Maybe the first person that ever saw these things gave them these curious sounding names, but now that we know more because of science, we realize that the names for pineapples and butterflies don’t have anything to do with their species”. I went on to explain to them that just like tomatoes are scientifically a fruit, we have named them vegetables. Perhaps it goes back to how they were prepared. Maybe because many recipes called for them in soups, stews, sauces, and salads, like other vegetables such as greens, mushrooms, and beans, people began to call them vegetables and the name stuck. Fruits, on the other hand are enjoyed alone as a snack. Can you imagine biting into a tomato as an after lunch snack? This is much more closely associated with an apple, an orange, or even a pear. By now, most of the students were nodding in agreement. I wanted to bring the conversation back around to something more practical. I asked them to think about some words and expressions that we use everyday such as: web, net, and hang-up the phone. These words all began meaning something else, but the way they are used today has changed. This is similar to what has happened with tomatoes being actually being a fruit, but referred to as a vegetable because of how we use it and how it has been used. I think both the students and I were a little more satisfied with the classification of tomatoes. Hopefully, as students read and encounter words, they will think a little more critically about its name and the usage of that word. Thank you Ms. Melodi Charles, Ms. Jennifer Swift, and the North Carolina State University Horticulture Lab for sharing your knowledge about plants with us; and above all, thank you for some food for thought. I’ll have mine with a little tomato ketchup. I was really amazed by their genuine curiousity about the subject, the personal connections that they made, and the amount of background they already had about tomatoes and plants. I think that this will become a great launchpad for their research going forward. Students will be using Epic! non-fiction books, a symbaloo of web sites, and a Skype conversation with a botanist from NC State to research and answer their questions. I feel that by allowing the students to research the questions that they have generated, this will motivate them to read more and thus will improve the quantity of their writing about a subject. The emphasis of the lessons in this unit however, is not entirely on content-acquisition, although students are acquiring information about tomatoes and plants, their focus is on evidence-based writing and supporting their speaking with fact-based details. The students will practice communicating information that is supported with evidence from a source. 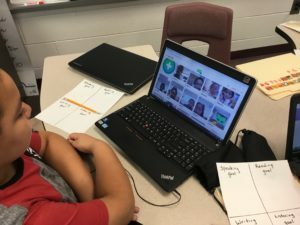 To assess themselves and other students and to simultaneously create notes on information about content, students will be creating their own Kahoot! questions to use for game style review. Although most of my students still need some support to be able to communicate using science discourse and vocabulary independently, a major advantage to this project is the fact that students are collecting and interpreting real data about an experiment that they are invested in. I have already seen a difference in the manner that they communicate. I hope that this continues as they begin to collect and visually differentiate the data from the different kinds of tomato seeds. Posted on January 21, 2019 Leave a comment on PBL, Inquiry, and Research: What a way to begin 2019! That’s what a colleague of mine said after observing one of the lessons inspired by my Kenan Fellowship product. I have never been prouder. Proud of my students, proud of my mentor, proud of the Kenan Fellowship support partners, and proud of myself as a teacher. I am finally teaching the unit originally conceived during my summer internship and at the Kenan Fellowship summer and fall institutes. To begin with, my Kenan Fellowship has completely changed the way I approach everything that I teach. And I do mean everything. For example, my first lesson this year was having students communicate their personal ESL goals. This entails them looking at their past year’s language proficiency scores and deciding on an area to improve. I typically would ask them to support how they will do this with several details. 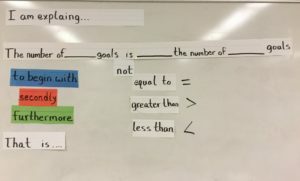 While this activity is a personal goal setting activity, designed to boost self-confidence and provide motivation, it also gives the English learners that I teach valuable practice in organizing and supporting their thoughts orally and in writing. 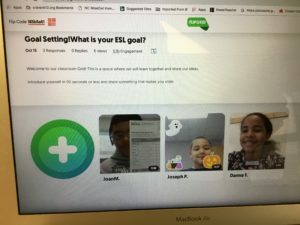 This year, because of my Kenan Fellowship product, it also served as a listening activity which students used to collect, interpret, and communicate data about each other’s goals. Due to the influence of my fellowship product, this lesson led me to focus on the background that the students would need to begin collecting, interpreting, and communicating the data for the tomato seed project later in the unit. Even as they communicated the data about their peers’ goals, they are beginning to use science/STEM discourse and developing inquiry skills. 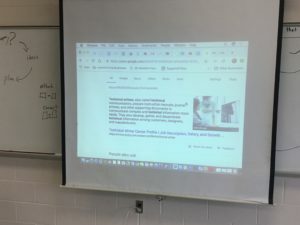 As additional practice gathering data, I planned another lesson where students created Google Forms to ask more questions to a larger pool number of people. This gave students still more opportunities to practice data collection and data interpretation. Of course, they also practiced language skills by communicating the data that they collected and interpreted. Needless to say, without my Kenan Fellowship product guiding my planning, it would not have occurred to incorporate this so early into the unit and begin to focus on the science skills this soon. Additionally, focusing on inquiry skills during the early lessons gave me a chance to scaffold these science skills without incorporating the science experiment content, which can be overwhelming for the students. After lessons that incorporated opportunities to practice collecting, interpreting, and communicating data: First, with their peers’ goals, then with a survey they received from me, and finally with a survey that they created and sent themselves, the students have sufficient background to collect, interpret, and communicate the data from the tomato seed experiment in the lessons that will follow. The next several lessons will involve students researching how a tomato seed grows into a full plant with its fruit. The process for learning about the tomato plant life cycle will involve the Project based learning model. When I explained to one student that he would be growing live tomatoes in the classroom and collecting and communicating data about their growth to actual scientists, he simply said, “whoa!”. My students and I are really excited about how this unit is going so far and can’t wait to proceed. We don’t get to choose what happens to us, but we do choose how we deal with it. It has been a little more than seven weeks since my last blog post. 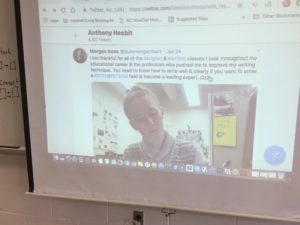 Originally, I had planned to blog monthly about my journey along with my students’ journey to what I hoped would be an awesome class project based on my Kenan Fellows internship this summer. However, a catastrophic event occurred a little over 10 days into the school year….Exactly. 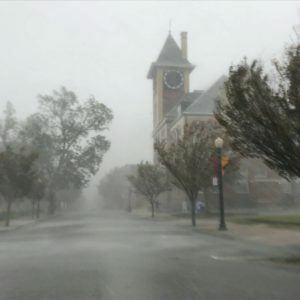 Hurricane Florence made landfall on our coast, directly impacting our community of New Bern and Craven County. While, at first, I thought this hurricane would be a minor one. I thought we would miss a few days of school, a little wind, and rain only . However, as the rain, wind, and damage began to mount, I quickly realized that this was no ordinary storm. 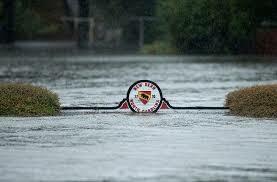 I would come to realize that this storm would be an event that would cha nge our community like no other. In the aftermath of Hurricane Florence, while sitting without power, I humorously thought about how far off my original schedule of implementing my product for my Kenan Fellowship I would be. An inconvenience to the business of our designed planter to hold our “space seeds”. I wanted to get on with the growth comparisons of “space seeds” and “normal seeds” that the experiment called for. 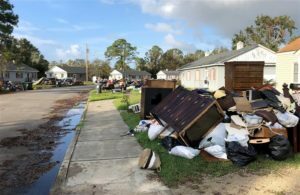 Then, I began to hear about the devastation and destruction all over the county and other surrounding areas of my community. Friends from out of town called to check on us. A former student who is now in Italy even called because he’d heard about the storm. As more calls came in from my son’s teachers, friends and family saying, “We are just calling to see if you need anything.” More messages of concern from some of my Twitter PLN (Professional Learning Network). 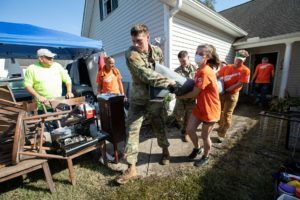 Later in the week, teachers, administrators, and colleagues began to rally together to use these days out of school to help our community rebuild. During the more than twenty days without school (and some of those without power), community members, church leaders, and educators helped to distribute food and clothing to members of the community. We went door to door to check on neighbors and help to clean debris and repair rooftops damaged by the wind and rain. We tarped roofs, gutted flooded homes and cleaned mold stained walls. My time out of school gave me the opportunity to reflect about the role of family and friends and the importance of community. Ironically, it was the time out of school where I had the opportunity to get to know my community better. Perhaps, Phil Boyte summed it up best. He said, during the Fall Institute, that connections lead to success more than any academic lesson. Since attending his talk, we have gone back to school: “Back to School 2.0”, as many dubbed our return on October 18th. I have learned over the last several weeks that we don’t get to choose what happens to us, but we do choose how we deal with it. Eight weeks ago, I was prepared to begin lessons based on the effects of gravity on tomato seeds. 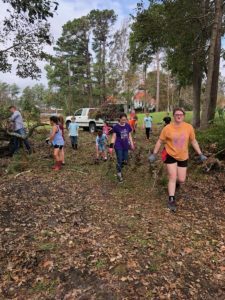 Because of the events associated with Hurricane Florence, I now see the importance of being an involved member of my community and building strong connections. After Hurricane Florence, our schools used elements of the Sanford Harmony program to build stronger relationships and teach empathy among the students. I observed students sharing about their losses and talking about their experiences during the hurricane. It is because of this, that I have decided to alter my project just slightly. While I will continue to have students use the engineering design process to design a planter for the tomato seeds, but going forward, I will incorporate more elements of design thinking into the process of creating solutions. I believe that it is important for students to feel like they can devise solutions to real problems based on developing empathy for the users of their creation. Who knows? Maybe, my students will help to contribute to the design of something that will rebuild parts of our community after the devastation from Hurricane Florence. Posted on November 4, 2018 November 8, 2018 Leave a comment on We don’t get to choose what happens to us, but we do choose how we deal with it. It’s been said that teachers are preparing students for careers that don’t even exist yet. I definitely believe this. I have witnessed how certain careers have become obsolete in our lifetimes. How many of us remember a telephone operator? What about a full service gas station attendant? And… if you’ve seen the movie; “Hidden Figures”, set in the 1950s, then you know that a computer wasn’t always the device that I’m using to write this blog now. 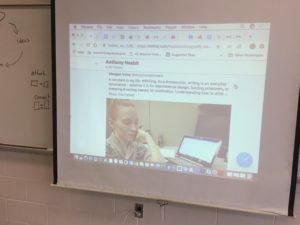 I prefaced my blog with these thoughts to show that my product will incorporate ideas that will help the English learners that I work with become real world problem solvers and effective communicators while gaining knowledge about STEM careers and activities. The weeks that I spent observing how engineers communicate and approach problems they encounter inspired me to create a product where students would ask a big question about a real problem, research it, and report about their findings to a real audience. I was fortunate enough to find an organization that was looking for “citizen scientists” to gather data about research that they are doing. This is the first part of my product: My English learners will investigate the effects of outer space on the seed germination of tomato plants and compare sizes and shapes of ground plants and space plants. The next piece of the product came about as I observed engineers engage in the engineering design process. I watched them plan, research, develop prototypes, and test their solutions to problems that had been brought to their attention. This led to the idea of having students design a suitable container to house the seeds from which the data would be collected. My English learners will be able to use the resources of my mentor organization, FRC EAST’s Fab Lab to 3-D print and laser cut pieces to assemble into a planter with a coded timer to self-water the plants. Another integral part of my product is English language development through communication in groups to discuss observations and to report data to an audience. I was inspired by the amount of authentic collaboration and communication that I saw among the engineers at FRC East. I saw that engineers need to understand a problem that is communicated to them, to meet and discuss solution ideas, plans, and to present their design idea through a PDR (preliminary design review). They may even have to defend and support ideas they have using data and facts. As one engineer stated, “100% airworthiness and safety is our goal. One error can cause a part to fail. Even if you are 98% certain, everyone must work together to get to 100%.” That is true collaboration. Overall, my product will have four components: 1) Designing a planter with a timed watering system using a scaffolded version of the engineering design process, 2) Investigating the effects of outer space on tomato seeds compared with ground tomato seeds, 3) Communicating scientific data and analyzing and interpreting patterns to an audience, and 4) Researching and exploring STEM careers. I hope my product will give English learners a chance to participate in project based learning, engage in the citizen science process, use the engineering design process, and have the chance to analyze, interpret and communicate data to an audience in an environment rich with language support strategies while engaging in STEM related activities and practices. My product transfers the knowledge about teamwork and collaboration that I gained from my internship directly into the team/collaborative approach that I will use to have the students report their observations of the plants’ growth, development, and size and shape comparison. I am hopeful that this will give the students practice working this way so that this practice of approaching a problem in this manner will be the normal process. I have seen research that shows how collaborative and cooperative learning can boost achievement, but seeing this practice in the workplace shows me that it will be a necessary skill that the students will have to use daily in their careers. An additional component of my product will include a STEM career night. This will give students a chance to present the results of their observations to parents and members of the community. Engineers and representatives from FRC EAST will also be in attendance to provide information about STEM careers. I am now more aware of careers involving STEM that exist in the community and will use this as an opportunity to inform students about them. Another future component of this product will be to have students visit the FRC EAST facility to observe STEM jobs. I have not really had any challenges implementing the product so far other than scheduling all the activities for the students at my schools. Communication with my mentor and the team has been great. The support has been great. I would consider the new found support from the engineers at FRC EAST one of my biggest successes. A conversation with an Engineer: What is a day like for an engineer at FRC East? Growing up in Eastern North Carolina, I had seen the FRC East sign many times, however, it wasn’t until spending a little over three weeks here completing my internship and interacting with some of the more than 700 engineers that I now understand what happens at FRC East. The Fleet Readiness Center East, whose mission is to generate combat air power for America’s Marines and Naval forces, could not remain operational without the engineers’, artisans’, chemists’, and mechanics’ roles in supporting the various aircraft in the fleet at Marine Corps Air Station Cherry Point. 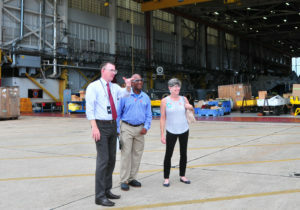 My first excursion at FRC EAST was a tour of the facility with Jamaine, an engineer on staff. He explained that the mission is a dynamic and collective effort that involves everyone from the production artisans-who produce and repair the parts, to chemists in the lab-who analyze liquids. 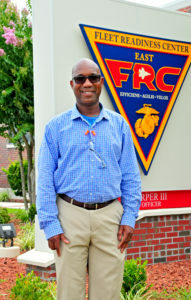 At the Fleet Readiness Center East, there are engineers who are involved in design and others have roles in investigations. Support of an aircraft may begin wth a request. That request can be initiated from the shop, a pilot, routine PMI (periodic maintenance interval), or the need to design a new part on any of the aircraft that may have been damaged in battle beyond repair. As we toured the hangar facility, I saw several of the aircraft that were in for PMI, as well as parts for other things at various stages of production in the engineering design process. According to Jamaine, there are two main types of engineers at FRC East: PSEs (Production Support Engineers) and FSEs (Fleet Support Engineers). Production support engineers can be specialized in certain areas and they generally support production of a part of an aircraft. FSEs support the fleet directly. They can talk to pilots, artisans, and mechanics to generate an inquiry to solve a problem. FSEs and PSEs both have to understand and view things from a systems perspective to be able to communicate with the diversity of personnel to identify an engineering design challenge. Looking over at some of the aircraft being maintained, Jamaine explained that work on that aircraft involves several teams: a team of artisans, an estimation and evaluation team, a quality assurance team, and a production control team, all of whom must work together with the engineers who create, approve and maintain design schematics and specifications for paints, coating, oils, and metals. Engineering involves a “business aspect”, as well. Engineers must not only focus on designing, but also have to meet timelines and be effective communicators while following the engineering design process. They can never compromise on safety or quality. Later during the week, I met with one of the chemical engineers at FRC East. Robbie and his team support the aircraft at Marine Corps Air Station through structural investigations and research and development of non-destructive metals. They work to identify the best combinations and concentrations of paints and coatings as well as develop, perform, and analyze stress tests for certain metals. Additionally, I had a chance to meet with Josh, a materials engineer who works as an investigative engineer at FRC East. His focus is failure analysis. He performs forensic analysis of materials. Nicholas uses CAD software to 3D print model specific parts that may have been created from the OEM (Original Equipment Manufacturer) blueprint. One of the last engineers that I had a chance to shadow was Patrick, a production support engineer. Patrick and his team are a “design heavy” group. As he explained, they design a lot of the equipment used to test, repair, and maintain the components that ensure the air worthiness of the fleet. One of the more interesting things that I did was to witness the design process from initial idea to completed product. I watched as the inquiry began with a work order. As Patrick explained, the order came from a mechanic on the floor who needed a more efficient tool to repair an particular aircraft. 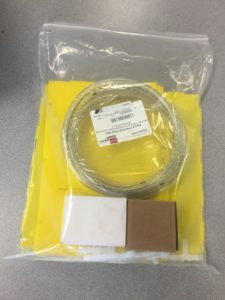 From there, a team of engineers look at the requirements, specifications, and tolerances of material to decide if the idea is feasible, safe, and cost-efficient. Then, the design team presents a PDR (preliminary design review), and later a CDR (critical design review). There is a great deal of collaboration and questions even at this phase of the engineering design process. From here, the engineers create a prototype model. This can be a 3-D printed model generated from a CAD (Computer Animated Design) software sketch or a working prototype created in the mechanic’s shop. At this point of the design, the model is checked and revised. If it meets approval, then the model is finalized and manufactured. It has been said that the internship is the “heart of the fellowship”, thus incorporating all of my vast and extraordinary experience with the engineers at FRC East into rich classroom lessons and practices that will impact my classroom and others will be essential. According to a recent article I read about the top skills that students will need to be successful in the 21st century, coordinating with others, complex problem solving skills, critical thinking skills, and creativity are among them. Some of my main practices and lesson plans will be heavily rooted in Collaboration, Creativity, Critical thinking and Problem solving skills. Among the many successes during my internship, being immersed in a STEM career for the past three weeks has been my number one success. I have seen that the kinds of problems that engineers solve inherently involve collaboration, creativity, and critical thinking. Going forward, all of the activities that I use in my classes will now focus on STEM. This will help me teach the English learners that I work with to develop these skills while simultaneously acquiring English. Another huge success of my internship, in addition to witnessing STEM careers up close, is that I also have made connections and have networked with engineers who can help me to incorporate authentic STEM activities into my classrooms. My internship has allowed me to see how engineers and careers function on a systems level. Witnessing this has given me insight to how I can begin to restructure some of my relationships with other educators going forward, which I view as a challenge. It will also be comforting to know that while developing these skills, I will also be exposing my students to some of the fastest-growing careers over the next twenty years so they will have an opportunity to explore these career paths to find their calling. So, this week at the institute, I have learned so, so, so, so, much. I have learned about everything from project-based learning, citizen science projects, STEM integration strategies, computational thinking, branding, to culturally responsive teaching, just to name a few things. At one point, I felt like it was just too much. Then, I thought back to the trip to the Tuckasegee River during the Goose Chase activity. 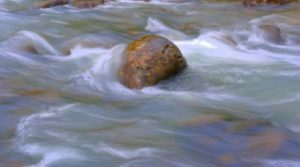 I remember seeing a rock in the middle of stream and I reflected on Michelle’s, Peter’s, and Mark’s messages about the necessity of moving water to increase the dissolved oxygen of the stream so life can happen. Surely, on that rock in the stream with water gently flowing over and around it, Michelle showed us a small speck invisible to the naked eye, but revealed, nonetheless, using our macro lens under the rock was a crane fly nymph. Life. I felt a little like that rock at times this week. The information flowed endlessly over and around me. But, as I quietly reflected, ideas began to emerge about how I can incorporate all of it into my lessons and in my class. My big takeaway this week is to going back to my district and having meaningful conversations with my colleagues and students about all that I have learned this week. Additionally, I am planning to implement project-based lesson units with my classes, with the idea that this will become my product for the year. This week at the institute changed me and challenged my thinking in a drastic way. I plan to go back to my classroom and continue to add as much “dissolved oxygen” as possible to my class and beyond so that new life will continue to happen. I don’t want to be the stagnant pond.